This is a sponsored post written by me on behalf of Dollar General for IZEA. All opinions are 100% mine. Keeping your household running smoothly on a budget seems like a monumental challenge. After all, a house just NEEDS so many things! Even if you pare down to the very basics, chances are you still have a long list. Batteries, light bulbs, cleaning supplies, food, water, pet supplies…the list goes on and on. Plus it’s not even an exciting list! Seriously, who wants to spend half their yearly earnings on something as boring as batteries and paper towels? Not me! That’s why I’m so happy that Dollar General offers a one-stop shop for all my household needs at GREAT prices. If you’ve been checking out our Dollar General posts each month, you’ve seen just how diverse the store really is. I’ve made everything from teacher appreciation gifts to winter car emergency kits using supplies from Dollar General. Those posts really got me thinking about the store in a whole new way. Long before those posts, though, I was using Dollar General for my everyday needs. 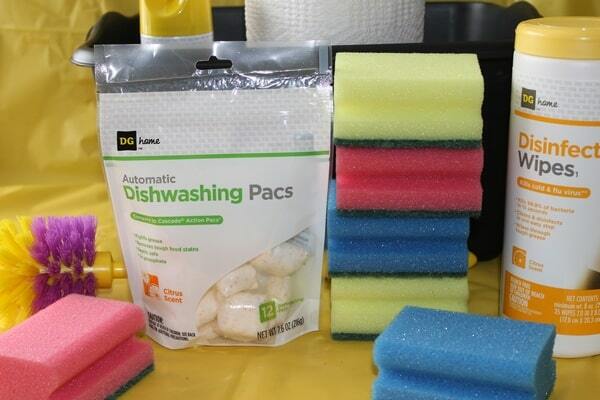 Take a look at just a few of the household essentials you’ll find at Dollar General! 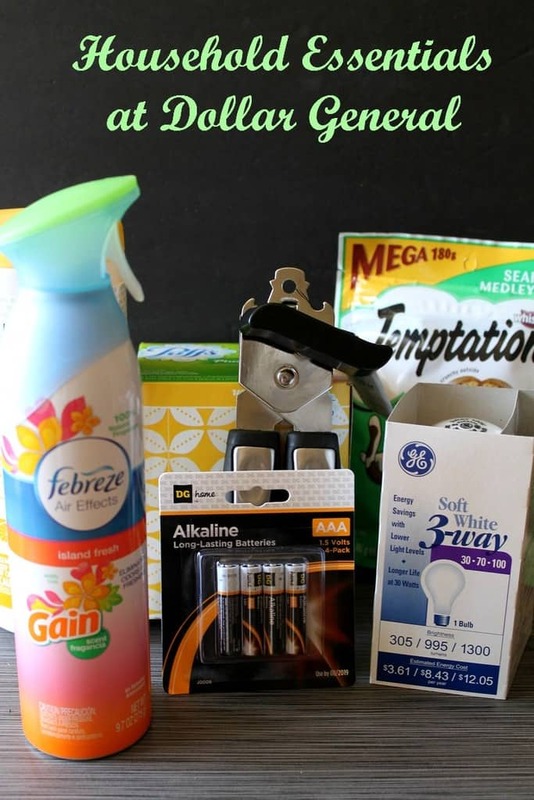 Everything you need for a clean home: Dollar General doesn’t just have the best prices on cleaning supplies in my area, they have widest selection. My local Dollar General has at least four aisles filled with cleaning supplies. Everything from their own brand to the most popular name brands. Their disinfecting wipes and Dishwashing Pacs work perfect, by the way! Essentials for happy electronics. We go through batteries like crazy here. Dollar General keeps me stocked up for less. They also have extra chargers, headphones and all the right cleaners for your gadgets. Kitchen tools you didn’t even remember you needed. I totally forgot I needed a new can opener until I was browsing their kitchen tools aisle! I love that they have several to choose from, including a really nice one for under $5. They have pretty much everything you need to prep and serve your favorite meals. Over in the grocery aisles, they even have ingredients to make them! Happy pet essentials: With three dogs and three cats, I go through a lot of pet essentials, as you can imagine. 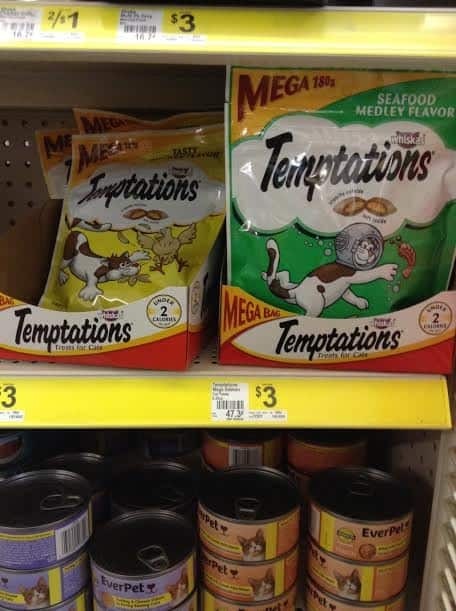 My cats are going through a Temptations-only phase right now. Those happen to be the most expensive of the treats sold in major retailers (not including specialty treats). Dollar General has a huge bag of them for just $3. Score! They also have fantastic deals on cat litter and food. Family health needs: As soon as I finish writing this, I’m actually heading back to Dollar General to pick up some medicine for my poor little buddy. Jacob has a sore throat and I just used our last dose of medicine. I bought tissues on my last trip for my allergies, but didn’t think to pick up more cold medicine. I think I was in denial, hoping that season was over! Thankfully, Dollar General has a great selection of medicines for both kids and adults, plus tons of fantastic first aid needs. Bottom line: you’ll find essentials to keep your home running smoothly down every aisle of Dollar General. From the basics on every list to specialty items like toys, greeting cards and seasonal supplies, it really is one-stop shopping at great prices. Just be sure to take some extra time to browse a bit and let inspiration strike. You never know what kind of fun craft idea you’ll also come up with while you’re there! What household essentials do you get at Dollar General? Tell us in the comments! Help! My 4 Year Old Is Aggressive! Will Lack Of Sleep As A Teen Make You Fat? We don’t have a Dollar General where I love but I do shop our local dollar store to stock up on items for the house – tin foil trays, poop bags for the dog, kitchen utensils, gift bags, cards, seasonal items etc. i had no idea they sold batteries. we go thorough so many with all the toys here. this is great! I didn’t know they made a gain fabreez!! I will be buying that!! I buy a lot of things at our local Dollar store. I like to get my kitchen essentials like can openers and cleaners there. They have such a great selection. There is a Dollar General going in right around the corner from my house. I’ve never been in one, so I was curious what kids of things they had. Thanks for the post. I’ll need to go check it out when it’s finished. I always stop by Dollar General when I need something! They have great things at a great price! I love shopping at Dollar General! You save so much money! 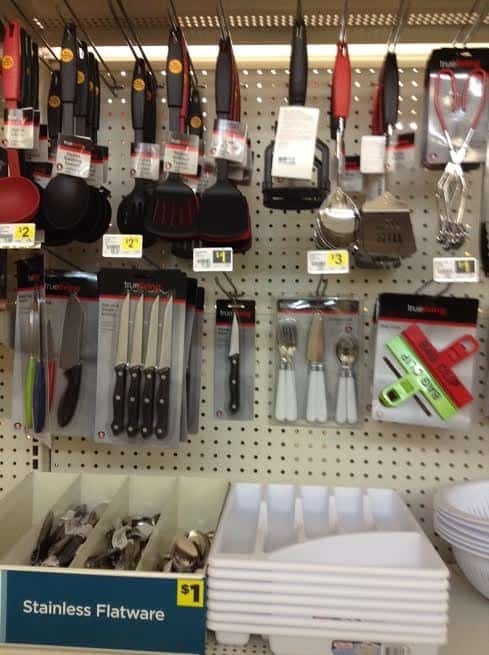 I love the Dollar store selections of kitchen gadgets and utensils!! I always find something I need there! I also find other great things at the dollar stores as well!! I always buy party supplies and bins at the dollar store! I think that household cleaners are great to get there! I’ve never been to Dollar General but luckily they just built one that’s not too far from my house, so I can’t wait to check it out! This is exciting! I just discovered we have a Dollar General Near me! I can’t wait to go check it out! I love shopping at the dollar store. What a great idea to get your batteries there – saves a lot of money! I love shopping at Dollar General. They have so many great things there. I love Dollar General. Dollar General gets a bad wrap, but it’s an awesome store! Wow! I had no idea you could find so many great items at Dollar General. I’ve got to swing by. Volunteering and Children- What Can You Do to Help?